Notes: “his father went down concerning the woman…” means Manoah talked to the Timnath woman’s male relatives to arrange the marriage, trading donkeys, money, or crops or whatever for this marriage. When the term “went down” is used, such as (famously in Genesis) “went down to Egypt,” and, in this case “went down to Timnath,” rabbinic commentators see this as indicative of a spiritual descent more than a geographic direction. Dead lion being the first strike. “The Wedding of Samson,” painted by Rembrandt, 1638. Samson, holding the beehive against his belly like a football, runs, continuing to book it in the opposite direction of killer bees, having given honey to his father (riding his donkey) and giving honey to his mom’s hand. I pictured his father (Manoah) going to the house of a PHILISTINE man to arrange the marriage, awkward. 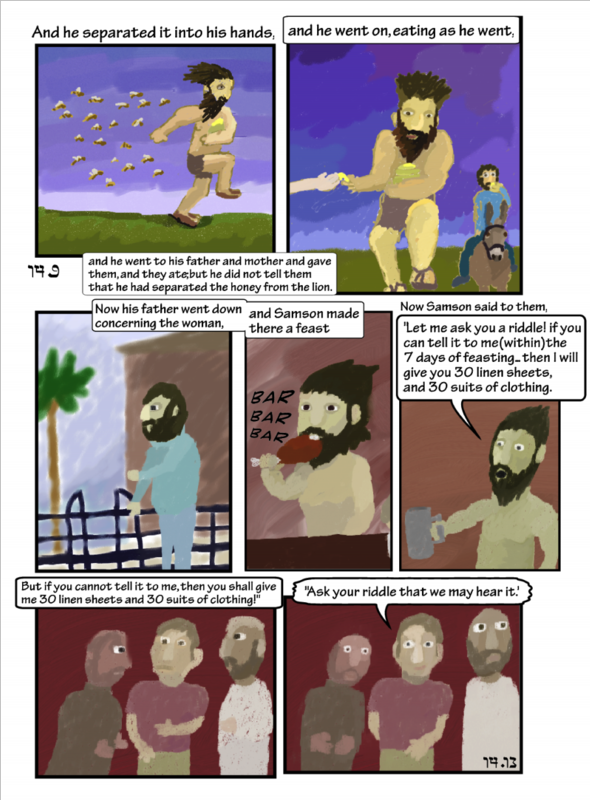 I depicted Samson feasting like the barbarian meme, om-nomming a leg of meat going BAR BAR BAR… the Greeks labeled non-Greeks barbarian because they thought non-Greek languages sounded like BAR BAR BAR BAR BAR BAR BAR! I show the Philistines he asked the riddle at the feast with a sort of muppety appearance. the three Philistines’ interest is piqued, and they look up.